Going trick or treating for Halloween may not be for everyone. 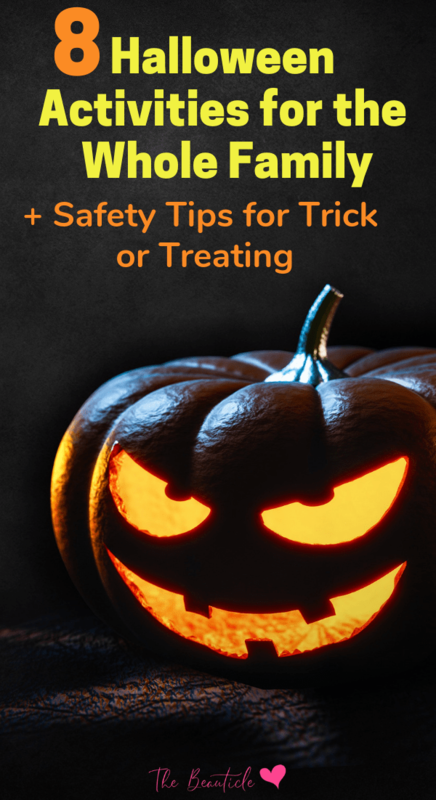 This article will help you to be safe if you do choose to go plus give you some ideas for Halloween activities for kids besides going door-to-door. Trick or Treating is a fun activity for kids every year on Halloween but it can be a scary idea of allowing them to go knocking door-to-door. Having a chat with them beforehand about your Halloween rules is a good idea. Give them these safety tips for Halloween to help keep them out of harm’s way. When your kids go trick-or-treating, you want them to have fun, but also to be safe. The following tips will focus on safety, from knowing where to go, to making sure their costumes won’t become a safety hazard. Kids get excited when they go out trick-or-treating, often running down the street and upstairs to get to people’s porches. If your kids have long costumes that reach to their feet, they might trip over them and get seriously injured. You don’t want your kids falling down the stairs or tripping over their costume in the middle of the street. Costumes with superhero capes, long dresses or gowns might be a little too long. Make sure you have your kids try them on and walk around with the shoes they intend to wear so you know if hemming needs to be done. While teenagers can usually go out on their own, you should not send your younger kids alone trick-or-treating. Even when they are in your own neighborhood, it will take a lot of stress off your mind if you walk around with them. This can become a fun annual tradition where you send them around the neighborhood to get their candy, then when they return, you can make your big Halloween dinner and sit down for some crafts or to watch Halloween movies. When you head out on your trick-or-treating adventure, practice caution even more stringently when you are out with your kids. Remove their masks on occasion so they can breathe, as some of them are very constricting. Be careful not to walk down the middle of the street, even if you see other families doing this. It may set a bad precedent for walking in the middle of the street at other times. Stick to the sidewalks or the bike lanes if the sidewalks are full. Be wary of any houses that have loud, barking dogs. Avoid houses that are not well lit out front and remind kids never to accept an invitation to go inside. You also want your own home to be safe for trick-or-treaters even if you will be at home handing out candy. Make sure your front yard is well lit not just with the porch light, but by placing battery-operated lights in your pumpkins and having other lights outside turned on. If it rained recently, put out rugs so kids don’t slip on the steps. Sweep away any leaves for the same purpose. Keep your dogs inside and restrained just in case. Not everyone wants to go trick-or-treating, whether you find it a safety hazard in your neighborhood, or you simply don’t live somewhere that makes it convenient. Luckily, there are plenty of alternatives you can consider. One great idea you can try on Halloween is to have a fun game night. This involves putting together some different Halloween-themed games that the kids can play instead of going out trick-or-treating. Try to have plenty of candy around the house to enjoy Halloween just as much as if they were going out for candy. You can even have candy-themed games, such as a Halloween piñata or giving out candy as a gift for winning games. There are plenty of different ways to do this. This is good if you want more of a quiet night at home. Maybe one of your kids is sick, or the weather is bad outside so you’re not able to do your typical trick-or-treating. You will find a wide range of television shows and movies for Halloween that are appropriate for kids of different ages. For younger kids, try The Great Pumpkin Charlie Brown, then get movies like Hocus Pocus and Coraline for your older kids and teenagers. Make some spooky treats and sit down to watch movies all night. Another fun thing you can do if you don’t want kids going door-to-door due to safety precautions is to take them to a trunk-or-treat. Instead of going to people’s homes, this is an organized event, usually at a local church or other organization that can be trusted. Everyone drives in their vehicles and opens up their trunk to put bowls or bags of candy inside. The kids get to go to each car, get their candy, then there is usually a party during or afterward the main event. This is a fun and safe way to spend Halloween with your family. For the kids or teens that enjoy being creative, crafts are perfect. It is another option when the weather is too cold or rainy outside on Halloween, so going door to door would not be the best idea. Instead, keep your kids interested in staying indoors by setting up some different craft stations inside. You can have regular pumpkins to carve or plastic pumpkins with pens and paint they can use to decorate them. You can make a big ‘pin the stem on the pumpkin’ for the door, or do any number of other crafts. If you’re staying home and throwing a Halloween party, don’t forget to choose some fun games! This allows you to have a family-friendly party for kids and keep them entertained. These are very simple games that require minimal items. All you need for this game is either a few rolls of toilet paper, some white fabric, or white crepe paper. It is a really fun and easy game that doesn’t require spending a lot of money. Whether you get stuck inside due to rain on Halloween night, or you want to have fun with the kids during your Halloween bash, it is a perfect Halloween idea! For the Mummy Wrap game, take the group of people playing and split them up into two teams. One person on each team will be wrapped, and the others will wrap him or her. Set a timer and the team that manages to cover their mummy first wins the game. You can make it even more fun by having the mummy run to a finish line to win. This is a fun apple-bobbing game, but with a twist. Get a large bucket or bin to put the water and apples in first. Put all green apples, but one red apple. The red apple is going to be the ‘poison’ apple from the Evil Queen. Everyone playing is blindfolded and will be bobbing for apples. The twist is that the winner is the one who manages to get the poisoned red apple. Cheering teams often help to make this game even more exciting for all by guiding on their teammate. You could play a little relay race in your backyard before it gets dark on Halloween. To make it themed for Halloween, make it a skeleton race. First, make two large skeletons with the same number of bones. They should fit on large pieces of cardboard. Two teams will need to run to the other side of the yard to grab one bone at a time, return it to the cardboard, and tape it up in the right spot. They keep going back and forth until the first team with a finished skeleton wins. Here is an alternative to the Pin the Tail on the Donkey game. You’ll need a large printout of a witch, but you really just need her face. Tape it up on the wall or a door in your home and have kids try one at a time to pin (use tape) their printout of a wart onto the witch. Have the target by right on the tip of the witch’s nose. They will be blindfolded when trying to do this and you could make them spin a few times first to make it even more fun. These are just a few fun Halloween ideas for your family. These are fun whether you choose to go trick-or-treating or throw a Halloween party. Just remember the Halloween safety tips above to keep everyone safe on this fun fall holiday.